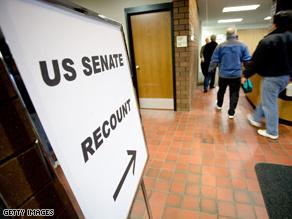 The recount in Minnesota could stretch into December. (CNN) – A crucial hearing today in Minnesota could have a major impact on that state's recount of its Senate race between Republican incumbent Norm Coleman and Democratic challenger Al Franken. The state's five member Canvassing Board, which oversees the recount, is meeting to decide how to deal with thousands of absentee ballots that are not included in the recount. Franken's campaign says the ballots were wrongly rejected, and that about 6,400 ballots were wrongly disqualified. Coleman's team says the board doesn't have the authority to include the disputed ballots in the recount. The hearing comes as the number of ballots being challenged by both camps grows. Just over 80 percent of votes cast in the state’s Senate race have been recounted, in a process that could continue into next month. The Secretary of State's office reports that 3,594 ballots have been challenged so far, with 1,836 questioned by Coleman's camp and 1,758 questioned by Franken's camp. According to the Secretary of State's office, 80.62 percent of the more than 2.9 million votes cast in the election were recounted through yesterday. When comparing the new tallies with the results from November 4, it appears Coleman's 215 vote lead now stands at 238. With the margin between Coleman and Franken remaining so close, the status of the ballots challenged during the recount and the disputed ballots that are not being counted could be crucial to the outcome of the recount. "This smells funny. Amazing all the votes are in Franken's favor." Hmm... this article says "When comparing the new tallies with the results from November 4, it appears Coleman's 215 vote lead now stands at 238." How does Coleman gaining 23 votes in the recount equal "all the votes in Franken's favor?" That is how recounts work. You don't know who gains or loses votes until you finish counting all of the votes. That is how elections work. Count the votes! If people cant follow simple directions when voting absentee or not, they shouldnt be counted. Simple as that. "Democrats want all legal votes counted. Republicans look for any possible way to exclude ballots if they think those ballots are against them." Thats really funny since they have both challenged about the same number of ballots. Oh, ye of little faith, nay sayers, and sore losers.... hold thy words and thou shalt see that a good and honest man has been brought into office.... and in time thou shalt have to eat thy words! Democracy can sometimes be messy. This is one of those times. It appears to me that there is a clear process laid out by law regarding the recount and any challenges made under it. It may take time and yes some recourse to the courts to clarify the question of the eligibility of the absentee ballots. A little patience on all sides would go a long way. Let the process work. This is what we mean when we talk about the rule of law. At the end of the day the whole purpose of voting is to ascertain the will or intention of voters. Sometimes these things get a little tricky but I would be concerned with a process that only focussed on strict adherence to technicalities and not the intent of the law. No matter, the republican party is in rapid decline and will be irrelavant soon. They've inflicted enough damage, their politics of hate has resulted in more people being hated than they can vote against in the future. Go back to sending your cash to your minister's heavenly bank accounts, and get out of the spotlight please.